Pre market stock trading is a very specific type of trader activity. It uses extended trading hours available on major US exchanges. During standard hours everything works under the rules offered by exchanges.Take U.S. exchanges and their trading hours as an example. They’re open from 9:30 a.m. to 4:00 p.m. Eastern Standard Time (New York time). But it’s also possible to enter orders and execute trades outside these opening hours. There are several marketplaces connected to the main exchanges or parts of exchanges that allow entry and execution orders during extended trading hours. Pre market trading hours are typically from 8:00 a.m. till 9:15 a.m. EST (New York time) for NASDAQ and NYSE stocks. But using NYSE Arca ECN you can enter and execute orders from 4:00 a.m. to 9:30 a.m. ET. Volume of shares traded during this extended time for traders is low. Exceptions are situations like earnings announcements or similar news publications. Then activity of traders and investors rises a lot. It is normal that spreads between bid and ask prices during this extended time period are very wide. It can be hard to buy or sell shares for a good price. The most profitable way to use this time for your trades is to use it to exit the trade. When I hold a position and I see huge price movement before the markets open I like to use such an opportunity to exit the position in full or partially. It is very common that share prices do not hold gains from the extended trading time period. I put this profit taking rule into my market system. Here I would like to present a chart that shows liquidity before regular US exchanges opening time. 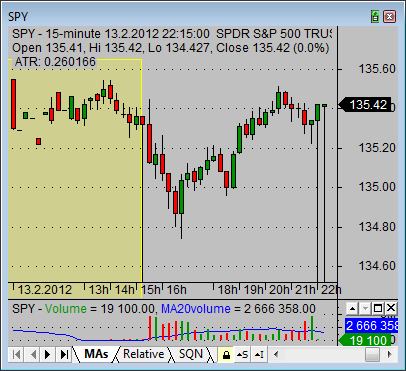 It is a liquid ticker with symbol SPY – an index ETF – and it can be noticed that this liquidity is pretty low. It is risky to trade during this time and I recommend making trades during regular US stock market opening hours only. And this advice is not for US markets only. These extended trading hours are risky on all stock markets around the world.